Agilent Technologies have introduced the 86100CU-400 measurement software to make precise phase-Locked loop (PLL) measurements, also known as jitter transfer measurements. The 86100CU-400 software is used with the 86100C DCA-J wideband oscilloscope developed by Agilent Technologies and can test a variety of PLL designs, and has been approved by the PCI-SIG(r) (PCI Special Interest Group) to perform PCI Express(r) (PCIe) PLL compliance measurements. The 86100CU-400 PLL and jitter spectrum measurement software from Agilent Technologies are applications that make fast, accurate and repeatable PLL measurements using a precision jitter source and receiver. 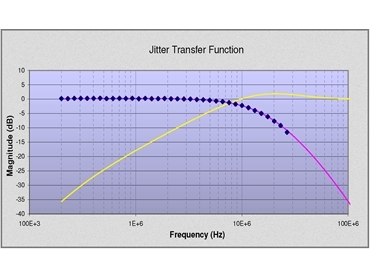 The jitter spectrum measurement software identifies the causes of jitter by recording jitter spectrum/phase noise measurements on data and clock signals. The 86100CU-400 PLL software developed by Agilent Technologies includes pre-configured set-ups and automated report generation to verify adherence to the PCIe 1.1 and 2.0 PLL compliance test guidelines, SONET/SDH jitter transfer tests, PCI Express reference clock measurements, spread-spectrum clocking (SSC) modulation analysis. The 86100CU-400 PLL is a Microsoft(r) Excel-based application, which runs on an external PC or on the 86100C DCA-J wideband oscilloscope that has the MS Excel application installed in it. The 86100C DCA-J wideband oscilloscope and the 86100CU-400 software available from Agilent Technologies can be customised easily by engineers for PLL applications. The architecture of the 86100C DCA-J wideband oscilloscope can test inputs/outputs from 50 Mb/s to 13.5 Gb/s (data signals) and 25 MHz to 6.75 GHz (clock signals), allowing engineers to measure several classes of devices that include clock extraction circuits, multiplier/dividers and PLLs. The 86100C DCA-J wideband oscilloscope can characterise PLL bandwidths of more than 80 MHz accurately. According to Agilent Technologies, the 86100CU-400 measurement software enables fast and accurate characterisation of the PLLs, which are used in the high-speed digital designs.